Here is a version of the classic dish from Valencia, Spain. 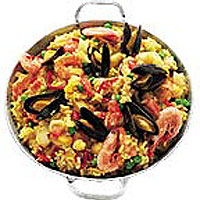 Paella derives its name from the dish in which it is traditionally cooked, the paellara. Scrub the mussels, discarding any that are damaged or remain open when tapped sharply, and remove any beards. Place in a small pan with 150ml cold water and bring to the boil. Cover and simmer for 2-3 minutes, or until they are opened and cooked. Discard any that remain closed after cooking. Strain the mussels, reserving the cooking liquid, and set aside. Place the saffron in a small bowl and pour 150ml boiling water over the top. Leave to stand for 10 minutes. Heat the oil in a large, heavy-based frying pan, add the onion and garlic and cook gently for 10 minutes, or until soft. Stir in the pimentòn and rice, then add the stock, wine, saffron and its soaking liquid, and the reserved mussel cooking liquid. Season and bring to the boil, then simmer for 10 minutes. Add the pimientos, fruits de mer, monkfish and peas, and simmer for a further 5-10 minutes, or until the rice is just cooked, almost all the liquid has been absorbed and the seafood is thoroughly cooked. Arrange the mussels and prawns on top of the paella, cover with a lid or foil and cook gently for a few more minutes, or until they are piping hot. Remove the pan from the heat and leave, covered, to stand for 5 minutes before serving.